Twitter is a great marketing tool. If you have a website but aren’t marketing it, who will read it? By using Twitter for marketing the right way, you can increase your website traffic significantly. Some people believe that the only way to get website traffic is either to rank well in Google, pay for Google ads or make it famous enough so people search for it. This is of course completely false because there are so many methods you can use to increase website traffic to your website apart from the mentioned ways. And social media is a vital part of that. More specifically, Twitter, which we will be talking about today. In this article, we’ll teach you How to leverage Twitter to Increase Website Traffic. But not only direct traffic such as link clicks but also by increasing the awareness of your website which will make more people search for your blog and ultimately help you rank higher in Google. Before you begin working with the various methods of increasing website traffic, you want to ask yourself a few questions. When you’ve got answers to those, you’ll have an easier time creating your traffic-generating strategies. Which industry does your site belong to? 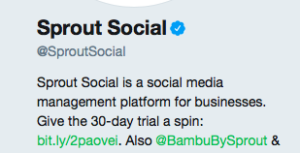 Does Twitter work for your industry? If you have never worked with Twitter before, it might be difficult to know, however looking at the demographics of the Twitter users will give you a better understanding of what kind of people are using Twitter and if they are within your target audience. Are there people whom you consider as competition? If there are, there might be a reason for it – it works! Take a look at the results they are generating and see if you can implement any of their strategies to market your website and increase traffic. When talking about any type of social media marketing, influencer marketing can’t be ignored. It’s so extremely powerful and yet very affordable that no brand want to ignore it. Take a look at if your competitors are using influencers and see if they have generated any results. Tweets are already short. 140 characters to be precise. However, writing shorter than that can help increase your engagement rate. 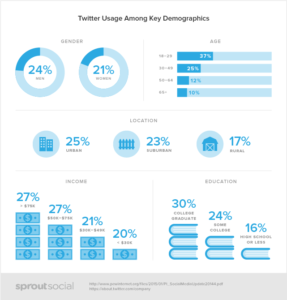 In fact, Tweets below 100 characters gets an average of 21% higher engagement rate. When using Twitter to increase your website traffic, you, of course, want to add a link to your website because that’s where you want to drive your audience. Because long links can take up a lot of space in your Tweet, shortening your links is almost always vital to fit anything else into the Tweet. Share a short controversial yet interesting Tweet that creates an interest and then add a shortened website where people can read more about the subjects. Doing so will create an interest and increase the number of people who click on your link. This one is a must, and it’s super easy to do! Your bio is one of the first things people notice when they visit your Twitter profile. If they are curious to learn more about you, they will surely click the link. You can add website links both in your “about you” section and in the contact section. Of course, you want to take advantage of both to get as much traffic as possible. Hashtags are a great way to increase your reach to people who are interested in the same subject. Use hashtags that are keyword-specific to get targeted visitors to your page. The more specific you are, the more targeted your visitors will be. If you’re new to hashtags on Twitter, a hashtag is any word, written with the # symbol in front of it. By using hashtags, you categorize your tweets and make them easy to find when people are searching for that particular subject. You can use hashtags in a few different ways to increase traffic to your website. You might have seen people with personal or branded hashtags that promotes the brand. If you promote your own hashtag good enough, people will start retweeting your posts and using your hashtags themselves in order to be noticed by you. When a lot of people uses your hashtag, you’ll also increase your website awareness which might spark an interest among some, leading to them visiting your website. General hashtags are hashtags including general subjects or keywords related to a certain subject. For example, #Socialmedia or #Instagrammarketing. General hashtags often (almost always) have much more traction than the branded hashtags, which means a lot more people are using them and searching for them. If you share good enough content that you’ll stand out from the crowd, you can get some serious exposure and tons of website clicks. Mentioning users in your Tweets has two benefits. First of all, they appreciate the mention, often like the tweet and leave a nice comment. Secondly, when you mention someone in your Tweets, they often retweet it to their followers, giving your Tweet with your website link much more exposure. When you mention someone, you simply put @ and write their username right after it. In this way, they’ll get notified of you mentioning them in your Tweet. There are several ways you can use mentions to increase your website traffic. Mention loyal followers as a way of thanking them, and you can be almost certain that you will get a retweet. If you have a guest blogger, mention them in your Tweet and increase the chances of the guest blogger retweeting it to their followers. If you get mentions every now and then, retweet them to show your appreciation. You can also retweet content which you find interesting. This can make the account that you retweeted from aware of your brand and maybe start following you. In the best case, they might even retweet something from you as a thank you, which means that they share a link to your website to their followers. The most simple thing you can do to get your content shared is to simply ask for it. In the end of a Tweet, ask people to retweet your content. This will let you put your website link in front of a bunch of new people, leading to more website traffic. Did you know that by simply adding the phrase Please Retweet,” you increase the chances of a retweet by 160%? Well, you do. And that is a very little effort for a lot of results. Because those retweets will surely lead to a bunch of traffic and followers etc. When you want people to click your links, you want to create an interest that leads to them clicking the link and finding out more. Therefore, adding a short snippet of your article, or from the content that’s on the page you’re linking to includes, you’ll spark an interest that many people won’t be able to resist. The more tactics you use to make your Tweets stand out, the higher engagement you’ll receive and the more website traffic you’ll get. Therefore, you should be implementing all methods you can of increasing your website traffic, because that’s what will decide your success. And implementing appealing visual content is one of them. When choosing an image to implement in your Tweet, make sure you do it carefully. You want to add images that spark an interest, just like the text you write. Make sure the image resonates well with the rest of the post. The image will work as a complement to the text, further empowering your Tweets message, making people click the website link in the Tweet. Twitter ads, or promoted Tweets if you’re only boosting particular tweets is a great way to reach a bigger audience. Promoted Tweets are affordable and generate a high ROI. In fact, a study found that when a Tweet without mentions and hashtags was boosted with ads, it resulted in a 23% website click increase. By boosting your Tweet, you have the opportunity of deciding who you are going to target and what budget you want to have. The higher budget you have, the more reach you’ll get, of course. Twitter has tons of marketing power. No matter if you want to spend money or not, you can generate tremendous marketing results – as long as you have a strong strategy and know all the tricks and methods you can use to increase your website traffic. These Twitter tips hopefully gave you the answers you were looking for on How to leverage Twitter to Increase Website Traffic. Implement all the tips above and you can be sure to see an increase in your website traffic.